P.S. I chose these to share because they all cost nothing to make basically, could be made from items already floating around your home, and wouldn’t take hours to complete. Enjoy! 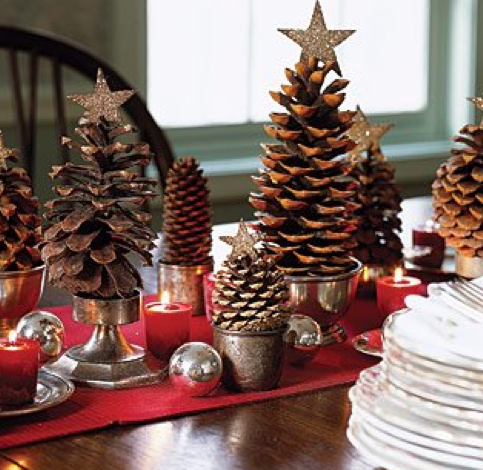 1) Pine comb Christmas trees: take a walk, gather, glitter, glue, stick in a votive holder or little jar, done. 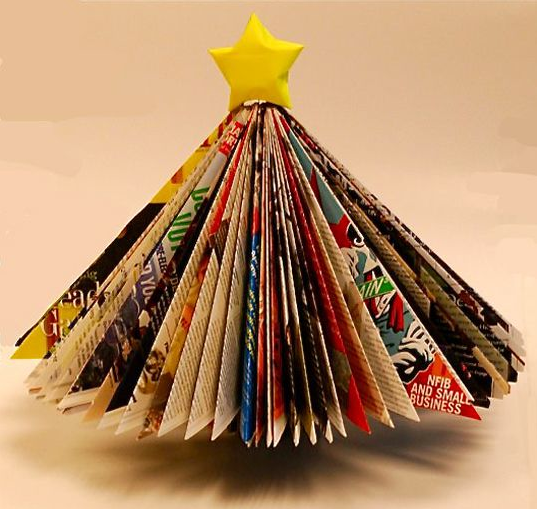 3) Magazine Christmas trees: I can’t get enough of these. 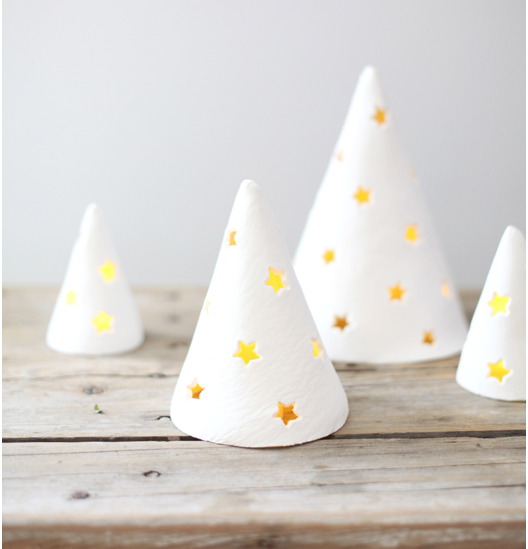 I’ve made them for our home and for the decor for several little events and they are so fun and easy. I got free (expired) magazines from the local library to make mine. Fold, fold, fold, tuck under, done! 4) Paper Snowflakes: These take me back to childhood! You can make them into garland, hang them on the windows, make ornaments…these classic and tasteful little guys never get old. 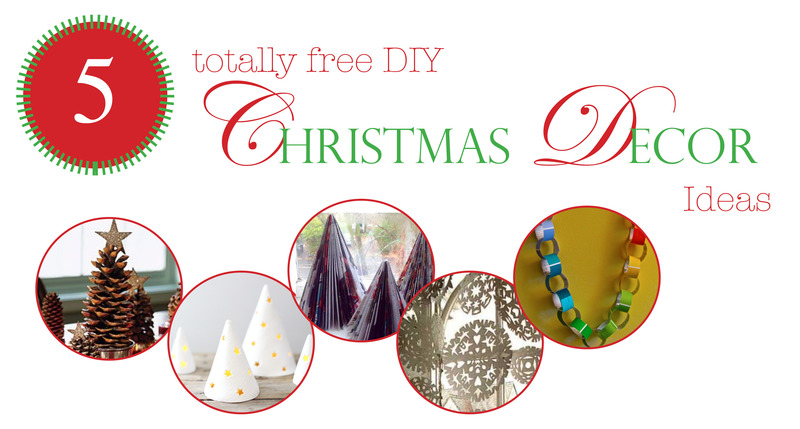 And you can even make them from coffee filters to save some cutting! 5) Good ole’ Garland: Last but not least, you can’t really go wrong with some lovely, simple, colorful garland to hang on the tree or to deck your halls. The ones above were done with paint sample swatches, but the possibilities are endless of what you could use. Get thrifty! You can even make an advent garland where you take off one loop each day leading up to Christmas. When my sister-in-law sent me this precious wreath (photo on far left) as a gift (overseas in the mail and it didn’t get crushed!) I was in love! It’s elegant, simple and the best part about it is that she made it herself with love. She picked up a dictionary at the dollar store and then dipped the pages in tea to give them an ‘aged’ look and then went to town with the pages. I think this is the perfect gift/holiday decor since you can basically make it for free and it has such a unique charm about it. There is a shop in Oxford that has loads of books you can pick up for free and I’m always seeing ‘free book’ piles at libraries, etc. On the cold winter nights ahead bundle up and get to rolling and gluing! Enjoy. Are you moving into another graduate student housing dorm soon? Are you packing up and moving for a graduate degree or post doc. into yet another rented space? Or are you staying still, but just oh so ready to have a home of your own? If you flip through some of our Beauty & the Budget files, you’ll see we have lots of tips and ideas to hopefully get you thinking about how to beautify your space, even if it is only for a few months or years. You can even read this post on how strongly I feel about the importance and value of creating a home that really reflects who you are, even though the space might be temporary. As this is the season for moves and transitions, I’ve done some searching online and below are some of the best ‘tips for renters’ that I could find to pass along. Even if you can’t paint the walls, have you thought of using tempaper (fancy pants temporary wall paper) or purchasing fun chalkboard or sticker decals, or even painting some furniture to give you some color? Have you thought of getting new hardware for the kitchen and bathrooms to give the cabinets a facelift or even taking the cabinets off and storing them to have a fun open storage thing going on? What about embracing bold colors in small spaces through a new rug or curtains or adding more throw pillows to the couch? Lots of fun ideas below to bring life to a rental space. I hope some are helpful and encourage you to make your new abode your own! I’m not a particularly crafty person. I tend to draw my creativity from my friends, even going so far as letting them ‘create’ for me. It’s something I have to work very hard at, so if I do find myself in ‘create’ mode, I usually have to give myself a loads of space and time to finish. Every once in awhile, I do find a project that I want to work on. I saw the below project a few months back (I think on pinterest? ), and decided it would make a great Valentine’s Day gift for my better half. We tend to not celebrate Valentine’s Day (Soapbox: I really don’t need a designated day of the year for my husband to tell me he loves me. He does that every day), but this year I wanted to do something that we could have fun with year round. I went to a local craft store to purchase a frame, silver wrapping paper, and stencil letters. I cut a square of the silver wrapping paper to fit inside the frame. Using clear tape, I pasted the wrapping paper to the back of the frame, making it the background. I cut the stencil letters out, arranging the message on the frame’s background, still a bit undecided of what the final layout will look like. You’ll see I left about 2 inches at the bottom of the frame, plenty of space to write a message. I’ll hang this somewhere in our flat, so we can leave little messages to one another year round. Easy project, costing no more than £10, and I get to write love notes to my man year round. So, swap parties are pretty much the greatest thing ever dreamed up! Have you heard of them or attended one? If not, I suggest you get on top of planning one immediately. Following suite in Beauty and the Budget’s ‘trash to treasure’ series, we wanted to share with you some photos and tips from our recent ‘Swap Party’ in Oxford. Swap parties are incredibly easy to set up, a great excuse to play dress up and the most rewarding way to ‘shop’ imaginable. It’s also a perk seeing that top you never wear turn out looking fantastic on a friend! All you need is a space large enough to host at least ten guests and room to spread out clothing and accessories for viewing. We did our swap the simple way. We divided up all the clothes into small, medium and large sections and basically had a ‘free for all’ and let everyone shop all at once, but you might choose to draw numbers or give guests tickets when they arrive to break it up a bit. Everyone who attended our swap took home something new to add to her wardrobe and no one spent a single pence (or penny)! I even took home a pair of Joe’s (designer) jeans that fit me like a glove. Trash to treasure! Here are some great links to get ideas on planning your own swap party. Here, here, here, or here.